Bravo aux joueurs ayant fait un bon/joli mois de Juin ! Par ici, a Cahors nous n'avons pas "exploité" au maximum les chances qui nous ont été offertes...Mais, c'est ainsi quand le choix "TURF PRUDENCE" est appliqué. Continuons la Prudence comme a notre habitude... Nous ne le repeterons jamais assez : Ne pas jouer a toutes les courses ! Sinon, nous aurons vite fait de reperdre a droite ce que nous aurons gagné a gauche. Attendons ce 1er gain correct qui nous mettra a l'abri et a l'aise...Puis continuons nos jeux intelligents et originaux ! Bon mois de Juillet a toutes et tous ! COURSE QUINTE=PERDUE, PAR ICI...BRAVO AUX GAGNANTS DU JOUR . PRONOS TURFY/JEUX UNITAIRES: 2 SUR 4/PMU=17.40 € POUR 3 €. PRONOS TURFY/JEUX UNITAIRES: JUMELE 14-11 GAGNANT=11.00 €/JUMELE 14-11 PLACE=4.70 € POUR 1 €/2 SUR 4/PMU=6.60 € POUR 3 €. COMME CONVENU, PAS DE JEUX POUR NOUS ICI, A CAHORS, CE JOUR NON PLUS...BRAVO AUX GAGNANTS DU JOUR, PUISQUE IL Y EN A QUELQUES UNS. BRAVO DE CE JOLI ZECOUILLON !!! SUR CE STYLE DE QUINTE A FEU ORANGE/PETITS RAPPORTS, C'EST SOUVENT ZECOUILLON QUI NOUS AIDE ET, PAR ICI, NOUS AVONS MISE QUELQUES"BILLES"SUR NOS 3 DADAS/ZECOUILLON ET NOTRE 1 ARRIVE 4EME ET C'EST TANT MIEUX. PRONOS TURFY/JEUX UNITAIRES: 1 ZECOUILLON=19.30 €/JUMELE 17-2 GAGNANT=12.40 €/JUMELE 17-2 PLACE=6.40 € POUR 1 €/2 SUR 4 PMU=17.10 € POUR 3 €. BRAVO AUX GAGNANTS LORS DE CETTE COURSE QUINTE NOCTURNE A FEU ORANGE GAGNEE PAR UN FAVORI. DOMMAGE POUR NOTRE 8/ZECOUILLON QUI SE PLACE 6EME AU LIEU DE 4EME. PRONOS TURFY/JEUX UNITAIRES: 15 PLACE=6.10 €/JUMELE 13-15 PLACE=15.80 € POUR 1 €/2 SUR 4 PMU=27.00 € POUR 3 €. PRONOS TURFY/JEUX CHAMP REDUIT/COMBINE: TIERCE D=51.40 €/TRIO=89.40 €=89.40 €/BONUS 3 QUARTE=13.78 €/BONUS 3=6.80 €. COURSE QUINTE=PERDUE, PAR ICI...BRAVO AUX GAGNANTS DU JOUR QUI SE SONT AIDES DES METHODES TURFY...TANDIS QU'EN PRONOS TURFY NOUS NE GAGNONS RIEN CE JOUR . BRAVO DE NOS QUELQUES GAINS LORS DE CETTE COURSE QUINTE OU NOUS NOUS ATTENDIONS A MIEUX...CA REVIENDRA, COME D'HABITUDE. DOMMAGE EN PRONOS, POUR NOS DADAS 14/16 ZECOUILLON QUI SE PLACENT 5EME+6EME AU LIEU DE 4EME. MAIS NOS JOUEURS VISANT ZECOUILLON ONT TOUT DE MEME CELUI CI. PRONOS TURFY/JEUX UNITAIRES: 13 PLACE= 8.50 € POUR 1 €. METHODES TURFY/JEUX UNITAIRES: 13 PLACE= 8.50 €/12 ZECOUILLON=16.40 € POUR 1 €/2 SUR 4 PMU=117.00 € POUR 3 €. BRAVO DE NOS QUELQUES GAINS LORS DE CETTE COURSE QUINTE. PRONOS TURFY/JEUX UNITAIRES: 16 PLACE= 11.50 € POUR 1 €/2 SUR 4/PMU=41.10 € POUR 3 €. METHODES TURFY/JEUX UNITAIRES: 16 PLACE= 11.50 €/10 ZECOUILLON=14.80 € POUR 1 €/2 SUR 4 PMU=41.10 € POUR 3 €. BRAVO DE CE JOLI ZECOUILLON SUR CETTE 8EME COURSE ! (NOS METHODES TURFY DETECTAIENT 2 CHEVAUX ET EN VOILA 1 QUI NOUS AIDE...) IL SERAIT TEMPS QUE JUILLET NOUS"HONORE"COMME NOUS LE MERITONS. METHODES TURFY/JEUX UNITAIRES: 16 ZECOUILLON=26.90 € POUR 1 €. COURSE QUINTE=PERDUE, PAR ICI...OU LES RAPPORTS ONT ETE MINUSCULES, COMME NOUS NOUS EN DOUTIONS . PRONOS TURFY/JEUX UNITAIRES: 3-14 GAGNANT=19.30 € /JUMELE 3-14 PLACE=6.80 € POUR 1 €/2 SUR 4 PMU=3.90 € POUR 3 €. PRONOS TURFY/JEUX CHAMP REDUIT/COMBINE: TIERCE ORDRE=70.50 €/TRIO=34.95 €/QUARTE D=14.56 €/ZE4=12.90 €/BONUS 4=2.20 €/MULTI 7=3.15 €. COURSE QUINTE=PERDUE, PAR ICI...OU CE JOUR ENCORE, LES RAPPORTS ONT ETE PETITS, COMME NOUS NOUS L'INDIQUAIT NOTRE FEU ORANGE . PRONOS TURFY/JEUX UNITAIRES: JUMELE 2-10 PLACE=14.40 € POUR 1 €/2 SUR 4 PMU=7.20 € POUR 3 €. COURSE QUINTE=PERDUE, PAR ICI...ET OUI, PETITE PERIODE NEFASTE...AVANT LE RETOUR D'UNE AUTRE PERIODE FASTE...QUI NOUS RENDRA LE SOURIRE, EN PRONOS, PENDANT QUE CERTAINS COLLEGUES/UTILISATEURS DE NOS METHODES TURFY TIRENT LEUR EPINGLE DU JEU, AVEC DES GAINS ASSEZ CONSEQUENTS ! BRAVO ! A NOUS DE SAVOIR ETRE PATIENTS EN ATENDANT . PRONOS TURFY/JEUX UNITAIRES: JUMELE 6-11 PLACE=18.00 € POUR 1 €/2 SUR 4 PMU=15.60 € POUR 3 €. BRAVO AUX GAGNANTS QUI, COMME NOUS, ONT VISE ZECOUILLON LORS DE CETTE COURSE QUINTE NOCTURNE. PRONOS TURFY/JEUX UNITAIRES: 2 SUR 4 PMU=13.50 € POUR 3 €. METHODES TURFY/JEUX UNITAIRES: 13 ZECOUILLON=20.20 € POUR 1 €. COURSE QUINTE=PERDUE, PAR ICI...ET OUI, LA PERIODE NEFASTE CONTINUE...CECI DIT, NOUS ALLONS NOUS REGALER QUAND LES BONS VENTS REVIENDRONT NOUS VOIR . 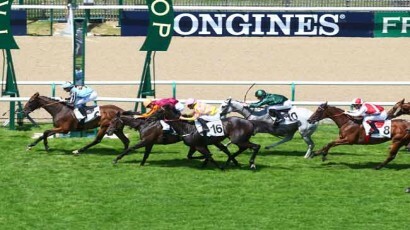 DOMMAGE, EN PRONOS, POUR NOTRE 14/ZECOUILLON QUI SE PLACE 7EME AU LIEU DE 4EME A BELLE COTE. 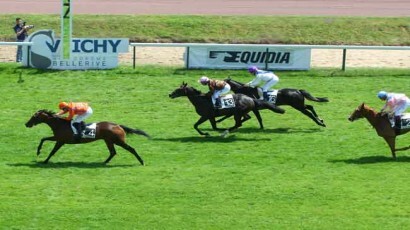 COURSE QUINTE=PERDUE, PAR ICI...DOMMAGE, EN PRONOS, POUR NOTRE DADA 3/ZECOUILLON QUI SE PLACE 6EME AU LIEU DE 4EME A BELLE COTE. ET OUI, LA PERIODE"MOLLE"CONTINUE ! NOS ANNEES D'EXPERIENCE NOUS ONT MONTRE QU'IL SUFFISAIT D'ETRE PRUDENT ET PATIENT...PUIS, NOUS SERONS A NOUVEAU RECOMPENSES. BRAVO AUX GAGNANTS SUR CETTE COURSE QUINTE QUI A BIEN MERITE SON FEU VERT ET LES BONS RAPPORTS QUI VONT SI BIEN AVEC. METHODES TURFY/JEUX UNITAIRES: 4 GAGNANT=76.60 €/4 PLACE=22.70 € /2 ZECOUILLON=14.80 € POUR 1 €/2 SUR 4/PMU=50.70 € POUR 3 €. METHODES TURFY/JEUX UNITAIRES: 8 PLACE=9.10 € POUR 1 €. METHODES TURFY/JEUX UNITAIRES: 16 ZECOUILLON=14.30 € POUR 1 € . PRONOS TURFY/JEUX UNITAIRES: 8 GAGNANT=41.40 €/8 PLACE=6.30 €/JUMELE 8-6 GAGNANT=75.50 €/JUMELE 8-6 PLACE=23.10 € POUR 1 €/2 SUR 4/PMU=5.70 € POUR 3 €. PRONOS TURFY/JEUX CHAMP REDUIT/COMBINE: TIERCE ORDRE=400.00 €/TRIO=52.20 €/BONUS 3 QUARTE=7.41 €/BONUS 3=2.40 €. COMME CONVENU, PAS DE JEUX POUR NOUS ICI, A CAHORS, CE JOUR...BRAVO AUX GAGNANTS DU JOUR, PUISQUE IL Y EN A QUELQUES UNS. PRONOS TURFY/JEUX UNITAIRES: JUMELE 11-16 GAGNANT=22.70 €/JUMELE 11-16 PLACE=9.50 € POUR 1 €/2 SUR 4/PMU=14.40 € POUR 3 €. PRONOS TURFY/JEUX CHAMP REDUIT/COMBINE: BONUS 4/5=3.20 €. PAS DE JEUX POUR NOUS ICI, A CAHORS, CES 2 DERNIERS JOURS...BRAVO AUX GAGNANTS. PRONOS TURFY/JEUX UNITAIRES: 2 SUR 4/PMU=15.60 € POUR 3 €. BRAVO AUX GAGNANTS SUR CETTE COURSE QUINTE QUI A BIEN MERITE SON FEU VERT ET LES BONS RAPPORTS QUI VONT AVEC. IL NE NOUS MANQUAIT QU'1 DADA POUR TOUCHER/GAGNER LE QUINTE DESORDRE=573.60 € OU LE ZE5=642.30 € ! PRONOS TURFY/JEUX UNITAIRES: MULTI 7=78.30 € POUR 3 €/12 GAGNANT=36.40 €/12 PLACE=7.60 €/JUMELE 12-6 GAGNANT=256.70 €/JUMELE 12-6 PLACE=75.30 €/JUMELE 12-5 PLACE=33.20 €/JUMELE 6-5 PLACE=26.50 € POUR 1 €/2 SUR 4/PMU=77.70 € POUR 3 €. PRONOS TURFY/JEUX CHAMP REDUIT/COMBINE: TIERCE D=306.60 €/TRIO=814.35 €/BONUS 3 QUARTE=72.28 €/BONUS 3=16.00 €. PRONOS TURFY/JEUX UNITAIRES: 18 GAGNANT=39.10 €/18 PLACE=9.20 € POUR 1 €/2 SUR 4/PMU=39.30 € POUR 3 €. METHODES TURFY/JEUX UNITAIRES: GAINS PRONOS+ 10 ZECOUILLON=15.90 € POUR 1 €. PRONOS TURFY/JEUX UNITAIRES: 6 PLACE= 8.90 € /JUMELE 4-9 PLACE=13.60 € POUR 1 €/2 SUR 4/PMU=55.80 € POUR 3 €. METHODES TURFY/JEUX UNITAIRES: GAINS PRONOS+ 17 ZECOUILLON=16.60 € POUR 1 €. PRONOS TURFY/JEUX UNITAIRES: 2 SUR 4/PMU=36.60 € POUR 3 €. METHODES TURFY/JEUX UNITAIRES: 10 GAGNANT=23.20 €/10 PLACE=4.10 €/15 ZECOUILLON=37.60 € POUR 1 €. METHODES TURFY/JEUX UNITAIRES: 11 GAGNANT=42.60 €/11 PLACE=6.00 € POUR 1 €. BRAVO DE VOS GAINS SUR CETTE COURSE QUINTE A FEU ORANGE . 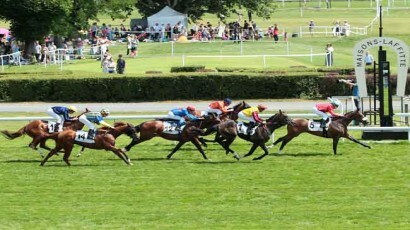 C'EST SOUVENT ZECOUILLON QUI NOUS AIDE SUR CE STYLE DE COURSE ET UN DE NOS 2 DADAS/PRONOS TURFY, LE 8 SE PLACE 4EME A TRES BELLE COTE, COMME NOUS POUVIONS NOUS Y ATTENDRE. PRONOS TURFY/JEUX UNITAIRES: 8 ZECOUILLON=25.40 €/JUMELE 14-9 GAGNANT=10.50 €/JUMELE 14-9 PLACE=4.70 € POUR 1 €/2 SUR 4/PMU=17.70 € POUR 3 € . PRONOS TURFY/JEUX UNITAIRES: JUMELE 6-3 PLACE=8.50 € POUR 1 €/2 SUR 4/PMU=7.80 € POUR 3 €. PRONOS TURFY/JEUX CHAMP REDUIT/COMBINE: QUINTE D=45.00 €/ZE5=84.90 €/ QUARTE D=30.16 € /ZE4=55.70 €/TIERCE D= 8.70 € /TRIO=26.55 €/MULTI 7=4.50 € . BRAVO AUX GAGNANTS SUR CETTE BELLE COURSE QUINTE QUI A BIEN MERITE SON FEU VERT ET LES BONS RAPPORTS QUI VONT AVEC. ET COMME DERNIEREMENT, NOTRE DADA 13 ARRIVE 5EME ET A FAILLI NOUS FAIRE GAGNER UN JOLI ZECOUILLON EN+++. TRES BIEN, ON SE CONTENTE DE CELA ! IL NE NOUS MANQUAIT QU'1 DADA POUR TOUCHER/GAGNER LE QUINTE DESORDRE=1327.80 € OU LE ZE5=2096.40 € ! PRONOS TURFY/JEUX UNITAIRES: 14 GAGNANT=66.80 €/14 PLACE=9.90 €/JUMELE 14-5 GAGNANT=206.70 €/JUMELE 14-5 PLACE=50.80 € POUR 1 €/2 SUR 4/PMU=22.80 € POUR 3 € . PRONOS TURFY/JEUX CHAMP REDUIT/COMBINE: BONUS 4/5=36.60 € . BRAVO DE VOS GAINS SUR CETTE COURSE QUINTE. PAR ICI, NOUS NOUS ATTENDIONS A MIEUX, SUITE AUX JOLIS GAINS DE CETTE JOLIE PERIODE...LA COTE DE NOTRE 4/ZECOUILLON A BIEN BAISSE DEPUIS CE MATIN ET LA VALIDATION DE NOS JEUX. PRONOS TURFY/JEUX UNITAIRES: 4 ZECOUILLON=10.00 € POUR 1 €/2 SUR 4/PMU=32.40 € POUR 3 € . PRONOS TURFY/JEUX UNITAIRES: 11 GAGNANT=23.10 €/11 PLACE=6.00 €/15 ZECOUILLON= 10.00 €/JUMELE 11-13 PLACE=26.10 € POUR 1 €/2 SUR 4/PMU=39.00 € POUR 3 €. 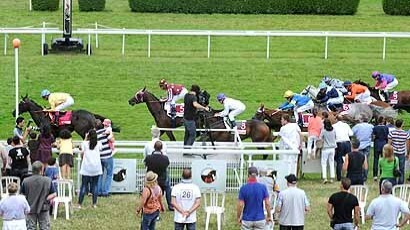 COURSE QUINTE=PERDUE, PAR ICI...DOMMAGE, EN PRONOS, POUR NOS DADAS 2+11/ZECOUILLON QUI SE PLACENT 5EME+6EME AU LIEU DE 4EME A BELLES COTES. ET OUI, NOUS AVONS BIEN AIME ET REUSSI CE MOIS DE JUILLET PLEIN DE "SUSPENSE/PALPITATIONS", PUISQUE CE N'EST QU'EN MILIEU DE MOIS QU'ICI, A CAHORS, AVONS ETE VERTS/POSITIFS/GAGNANTS, APRES UNE PERIODE INCERTAINE DANS LE ROUGE/DEFICIT. QUE DE BELLES LECONS TURF !